The latest investment strategies of Asia’s leading Tech, Media and Telecom companies will be under the spotlight at the TMT Finance Asia 2018 in Singapore on February 1, including opportunities in Artificial Intelligence (AI), Fintech, Digital Platforms and Cloud Services. “Investment in Asia’s telecom, media and tech sector is at an all-time high, with new digital opportunities driving a large chunk of M&A and new investments by telecom operators, emerging technology giants, media companies and our international investment and financing community,” said Ben Nice, Managing Editor, TMT Finance, the organisers of the event. For the digital platform sub-sector, key speakers include Go-Jek, Uber’s rival in Southeast Asia which recently raised over US$1 billion from Tencent; WeWork, the SoftBank-backed workspace tech firm with a reported valuation of US$20 billion; Indonesian media conglomerate Emtek, which has been investing in big digital firms in the region including Grab, iflix and PropertyGuru; as well as eatigo, HappyFresh, Zilingo and EASTY, which have raised or in the process of raising funds to fuel up international expansion. On Fintech, PLDT-owned FINTQ and PayMaya, Ant Financial-backed TrueMoney, as well as TransferTo will be discussing the opportunities for consolidation, M&A and IPO for fintech businesses in 2018. Alibaba Cloud, Australia’s Metronode and Bridge Data Centres will also be talking about expansion strategies for India, China, Southeast Asia and Australia. For IoT, executives from XL Axiata and Tata Communications, as well as Sigfox, eFishery and Pipeline Network are meeting to access the investment opportunities. Over 60 speakers have been announced in total including representatives from Axiata Group, Telkom Indonesia, Indosat Ooredoo, edotco, Bharti Infratel, Protelindo, Huawei, Goldman Sachs, I Squared Capital, DBS, ING, Linklaters, and IFC. 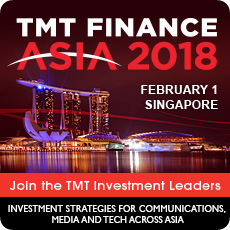 TMT Finance Asia 2018 is an exclusive telecom, media and tech leadership event, gathering key financial decision makers, CEOs, CFOs, CSOs and Heads of M&A, with the leading investment bankers, private equity investors and advisers to assess new growth strategies and opportunities for investment. The event forms part of the influential TMT Finance global event portfolio.